Define and Assess – What would happen if your business failed? 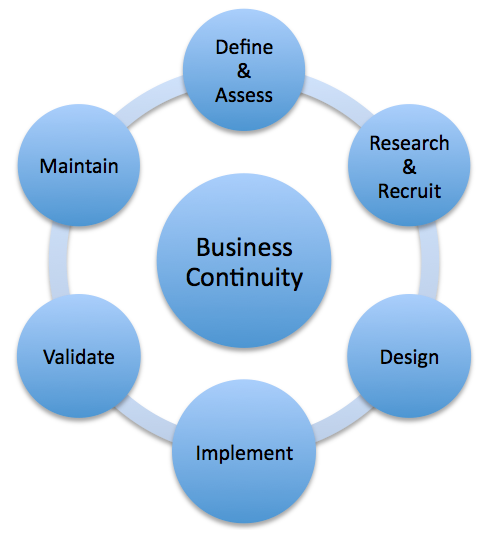 Define what your company needs to keep business continuous should a disaster occur. Research and Recruit – Talk to internal sponsors, suppliers and partners to find out what tools and options are available. Design – Create the best plan for your business. At this point, bring in technical resources and business partners to test the impact and implications of the proposed plan. This is where the greatest cost - and greatest success - will come from. Implement – Get the right IT equipment and start implementing the necessary steps to match the plan. This should be a phased approach designed to reduce impact on production systems. Validate – Test, test and retest the plan and its supporting systems. Take systems down and then document, step-by-step, the process to rebuild the application, network or storage to an operational state. This way, it is easy to understand how it affects users, the business and customers. Maintain – Make sure that the right tools and software are in place to monitor the equipment and networks that need to be available for the business continuity plan. Ensure that on-site spares or the proper service contracts have been budgeted for. Despite today’s budget pressures, it’s vital that all of your IT applications are protected and quickly recoverable. Business continuity plans are often overlooked due to financial and time constraints, but by following Overland’s simple steps and installing the right technology, they can be implemented, budgeted and executed in a timely manner. Visit our Overland Family of Storage Solutions including the SnapServer NAS and Overland NEO Tape Libraries.